Shieldon in game: 4,750 Who? Important notice! Pokemon Shieldon is a fictional character of humans. Shieldon (Japanese: ????? 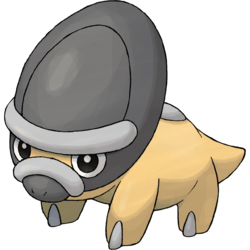 Tatetops) is a dual-type Rock/Steel Fossil Pokémon introduced in Generation IV. It is resurrected from an Armor Fossil and evolves into Bastiodon starting at level 30. Shieldon is a small, yellow, ceratopsian-like reptilian Pokémon. It has white toes and a white bump on its back. Shieldon has a dark-gray elliptical face, with a prominent white brow and a white rim on its black snout. Its facial hide is extremely hard; however, it is vulnerable when attacked from behind. 100 million years ago, Shieldon lived in dense forests. It has a habit of polishing its face against tree trunks. It eats grass and Berries. Shieldon made its debut in Ill-Will Hunting, where Hunter J tried to capture four of them. 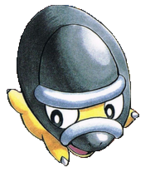 Shieldon made an appearance in Giratina and the Sky Warrior under the ownership of Newton Graceland. A Shieldon appeared in the boss fantasy of A Lean Mean Team Rocket Machine!. DP045 Shieldon Ash's Pokédex Shieldon, the Shield Pokémon. The skin on its face is very hard, and it has a habit of polishing it by rubbing against trees. Byron has a Shieldon that he was unable to befriend even after carrying it outside of its ball for an extended period. As Diamond was able to do so even without knowing it, he decided to give it to the boy prior to his training on Iron Island, which he names "Don". It evolved into a Bastiodon later in the showdown against Team Galactic. It was generated from a fossil dug out of a layer of clay that was older than anyone knows. It has a sturdyface. Many fossils of this Pokémon have been found, but almost none have shown signs of damage to the face. This Pokémon lived in primeval jungles. Few enemies would have been willing to square off against its heavily armored face, so it's thought. Moves marked with a superscript game abbreviation can only be bred onto Shieldon in that game. It rams with its rock-hard head. It also makes stones drop to attack. 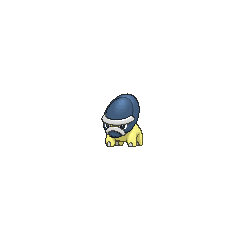 For other sprites and images, please see Shieldon images on the Bulbagarden Archives. 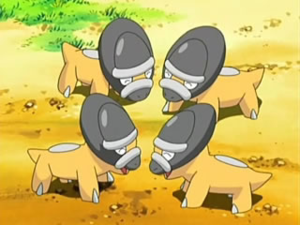 Shieldon and Cranidos evolve at level 30, the earliest of any Fossil Pokémon. 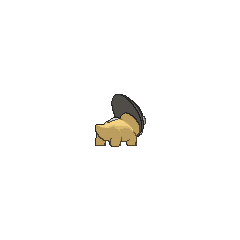 Shieldon is based on a ceratopsian dinosaur and a shield. Its lack of horns makes it particularly similar to Protoceratops. 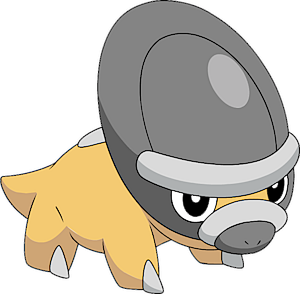 Shieldon is a combination of shield (referring to its shield-like head) and don (from δ?ντι dónti, Greek for tooth; a suffix in various dinosaur names). Tatetops is a combination of ? tate (shield) and tops (?ψ ops, Ancient Greek for face, a suffix commonly used for Ceratopsidae dinosaurs).